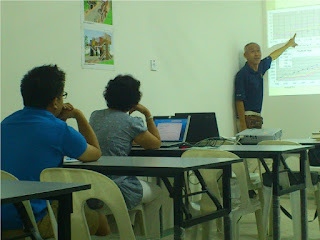 Sunday, 22nd July 2012 @ IEM Miri office. Investing in the stock market must be clearly differentiated from speculating in the same according to seasoned stock market investor, Ir Richard Teo, a past chairman of IEM Miri. This means it is important to do your own research about the economy, the industry and more importantly the companies that you might be considering to invest in. To start with he recommended a couple of classic books by investment gurus as background reading. The two books are: “Intelligent Investor,” by Benjamin Graham (1949) and “Common Stocks Uncommon Profits,” by Philip A. Fisher (1958). So unless you know the business and the industry of the business it is unwise to dabble in stocks. And then only if you have enough savings to use as investment. Because the next thing you need is patient (& a strong stomach) as volatility of market sentiment is a given even if there is nothing fundamentally changed in the prospects of your companies. He illustrated this based on his own investment in a banking stock which first went “under water” before it turned a good profit. However, there were also others where he was badly burnt. Re-affirming the saying that in life, there are only two certainties: death and taxes; Everything else is a case of calculated risks. In assessing a company, among a company’s strengths that you might need to take into account is its “goodwill” or intangible assets. This is because companies with a lot of “goodwill” (more commonly known as reputation or brand power) are generally more profitable and may need less capital for growth. Another thing that you might want to consider is the timing of your investment and usually you might wish to take advantage of market or industry down cycle i.e. when market (or industry) prices are generally depressed due to some form of crisis (or excess capacity etc). According to his observation, there had been a major market down cycle every past ten years or so. Once you are ready to take the dive, the procedure involving a stock broking firm or bank is fairly simple. And with facility such as CDS (Central Depository of Shares) you won’t have to worry about dishonest stock brokers playing tricks using your shares. Then having invested in the companies it is also necessary for you to continue monitoring not just their performance but also the industry at large since past performance is never a guarantee of the future and new industry players have been known to cause famous upsets to the status quo and this may include the local banking industry. In all about eleven people attended the very informative talk.